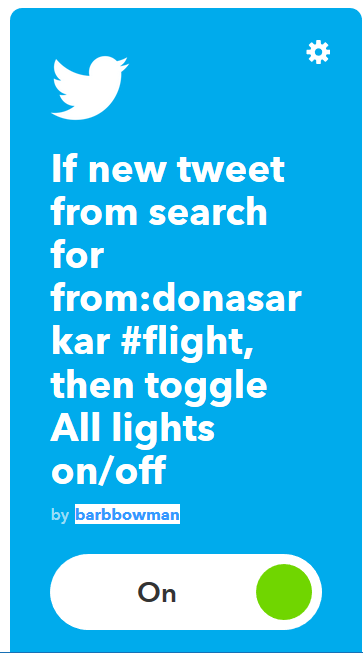 Dona has graciously agreed to include a new hashtag #flight when she tweets notifications about builds. 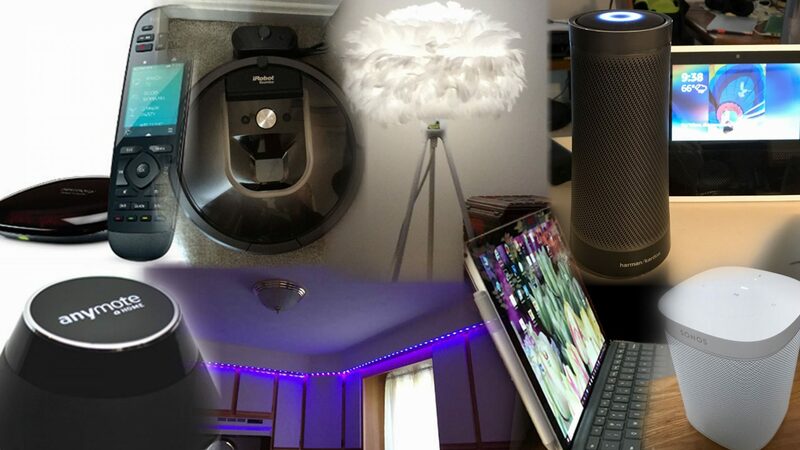 It is really easy to set up the IFTTT piece, and you will need to enable the Hue/LIFX integration by signing into your account if you haven’t already connected it to IFTTT. 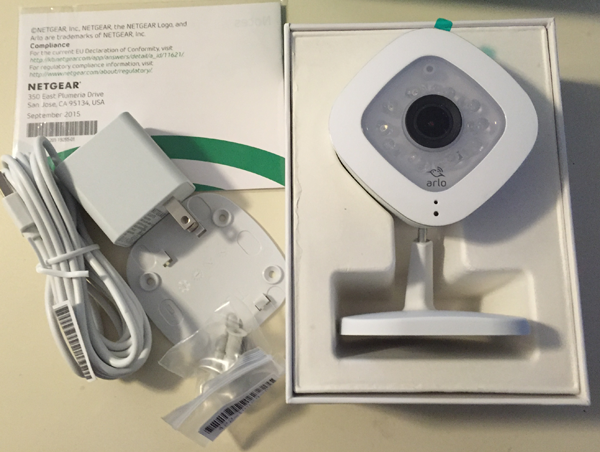 Arlo Q can be set up with an iOS or Android app, as well as a browser based app. I used my iPhone and it was quick and simple to set up an account as a new user. This is the first IP camera I’ve used that supports both the 2.4GHz and 5GHz Wi-Fi bands. 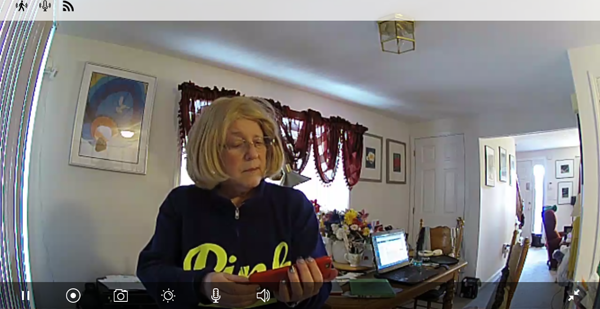 The camera is a 802.11n device, and I configured it to use the 2.4GHz band even though I have a dual band Netgear Nighthawk 802.11ac router that supports both 2.4 and 5GHz. Connecting to your wireless network is wizard based, including a neat QR code process where you place your phone 8 inches away from the camera which reads the generated QR code, wait for a pleasant chime to signify “success” and wait about 30 seconds while the Wi-Fi network you specified is provisioned and ready to use. While it is ready to use “as is” after this, you can go into settings and fine tune schedules, and you can rename the camera from its default alpha-numeric (useful if you have more than one Arlo camera). The iPhone app automatically filled in the SSID that my iPhone was connected to, which was a 5GHz 802.11ac band, but since I wanted to test with 2.4GHz, I had to supply the name of that network (no pick list is available, but that won’t be a problem for most people – I just specifically wanted to test on a slower connection to see worst case performance). There’s a scheduler that allows you full control of arming/disarming the triggered detection recordings and alerts, or you can leave armed/disarmed. Usage will depend on camera location and the kind of traffic you expect and when you expect it. The video quality is superb. There was hardly any lag on the 2.4GHz connection using Live view. While there’s no PTZ (pan and tilt) the field of view is very very wide and gives more than enough coverage (and this avoids the device being much heavier). 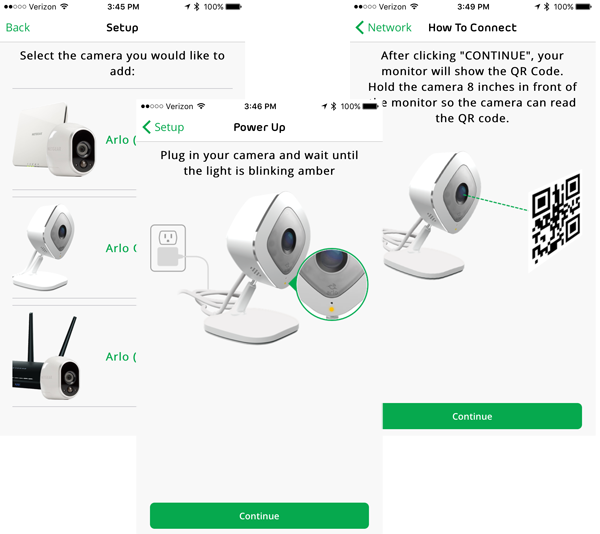 Unlike the other cameras of this type, Arlo Q also has user configurable “activity zones” that let you customize three locations that will trigger alerts. It was easy to configure these by dragging the zone around visually on my iPhone. This camera supports two-way audio, so if you’re in another room or miles away, you can kick the dog off the sofa. Alerts arrive by e-mail nearly instantly. The email includes a still image from the captured video and a link to view the full captured video event in your library. 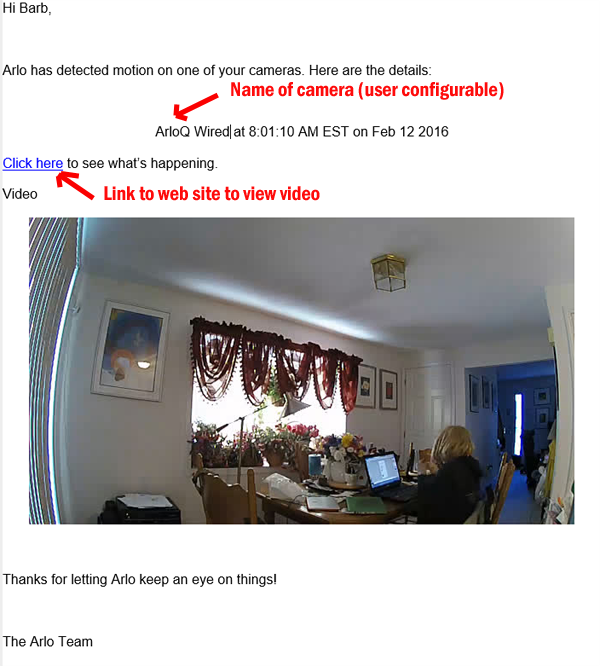 You can add “friends” to your Arlo account per the user guide “Friends can view live streams from your cameras, record video clips, view, share, mark as favorite, and delete clips from your library, and take snapshots. Friends can be granted limited access to some of the settings and features on your Arlo account. You can select which cameras friends can see (if you have multiple cameras) and what administrative rights are available to them“, so you don’t need to share your credentials will your kids but you can let them access features. I really like Arlo Q and highly recommend it. The Internet of Things isn’t arriving fast enough for me, but I’ve managed to jumpstart my Connected Home’s entrance into this brave new world thanks to Apple’s iOS HomeKit. What I have now using HomeKit is a preview of things to come, and I’m hoping that iOS9 brings some improvements and refinement, as has been rumored by many who more actively follow the iOS ecosystem. And I’m happy to play with what I have today, a somewhat fragile but working system that lets me control HomeKit enabled devices from multiple vendors both from my iPhone 6 and by voice command using Siri over my home network. Most of the top tier Home Automation and Control vendors like Insteon and Lutron, who already had bridges and addressable devices in the marketplace, are introducing HomeKit enabled bridges or have introduced them. Existing dimmer switches and on/off switches should work with the new bridges, but battery powered devices like motion sensors most likely will not work. There may be support for motion sensors in iOS9, but it’s not known if existing sensors will need to be replaced by a new HomeKit enabled sensor. 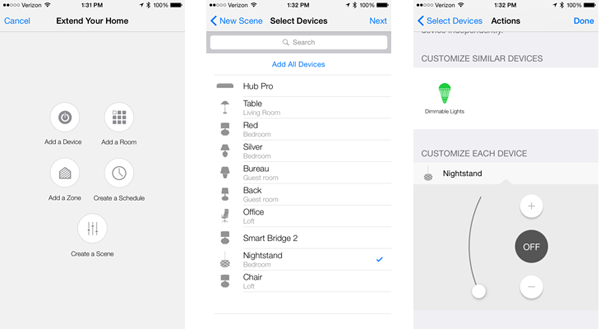 HomeKit can control devices, scenes that control multiple devices, rooms, and zones, depending on the iOS app. You need to add/discover a particular vendor’s HomeKit enabled bridge and you’ll need to add devices from a particular vendor using that vendor’s app. 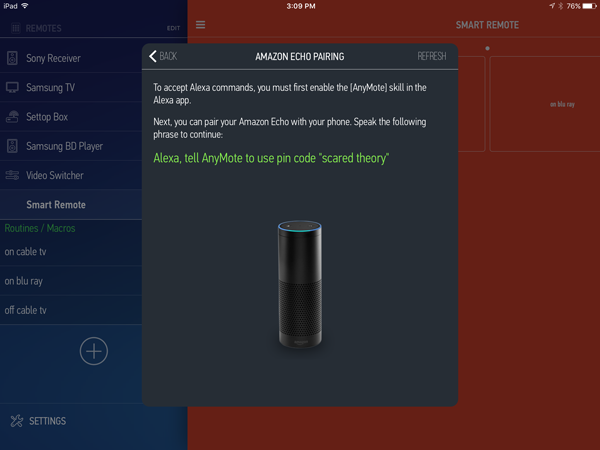 Once devices are enabled, you can use any vendor’s app to configure scenes, rooms, and zones, provided that the app supports this. There are only a few apps in the iTunes Store that work with HomeKit devices. Lutron’s App is sandboxed and only controls Lutron devices. It does recognize Rooms created by other apps. 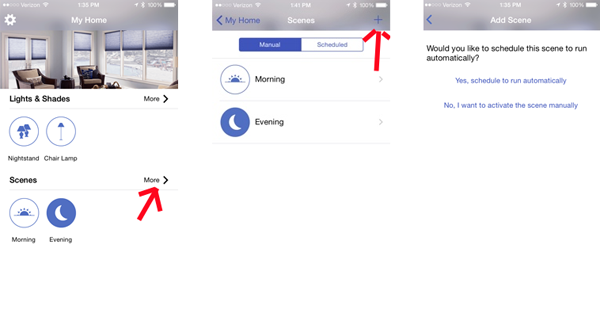 It can create Scenes, but only using Lutron devices as HomeKit devices from other Vendors don’t appear in their app. 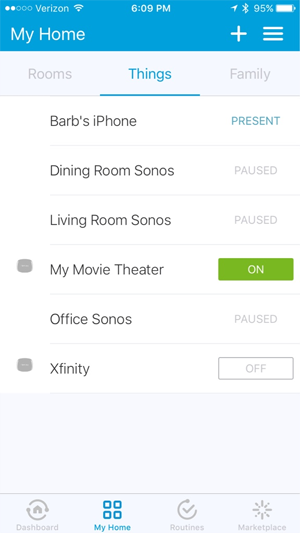 Insteon’s HomeKit enabled Insteon+ App has full HomeKit integration and no restriction on using other vendor HomeKit devices in scenes. 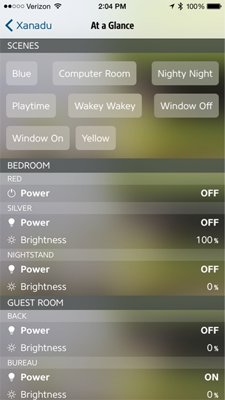 I can include Lutron dimmers in scenes I create in the Insteon+ app. 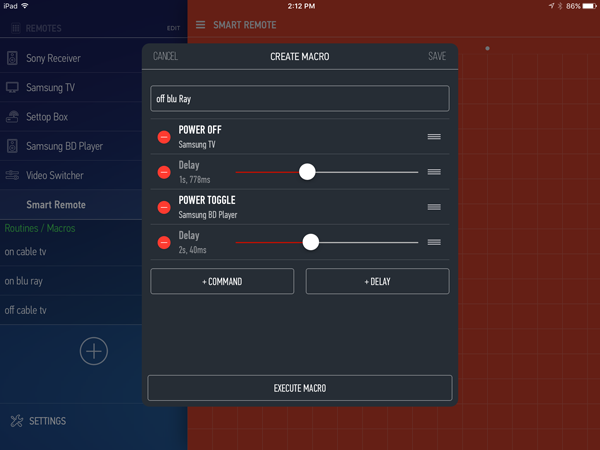 While I don’t have any Elgato devices, I actually like the Elgato Eve app best because it is easier for me to read. 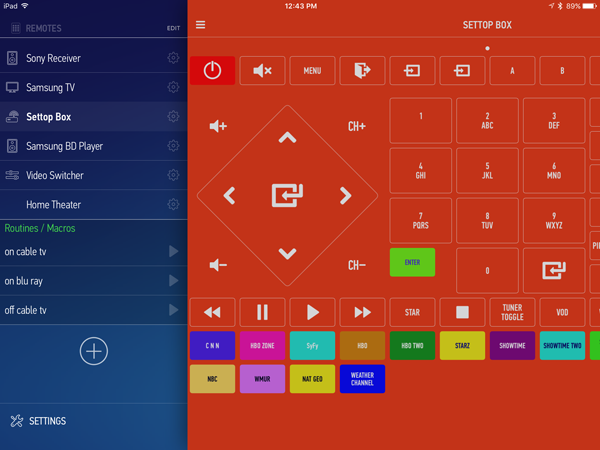 The Elgato Eve app also lets me add/edit scenes and rooms. I’ve got Hey Siri enabled on my iPhone 6. And I’ve got a charging cradle in my Bedroom where my iPhone spends the night. Siri integration with HomeKit is not perfect, but it’s pretty cool to tell Siri to run on a light or a scene, as shown in my video. 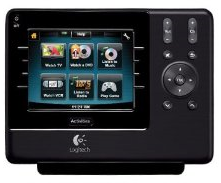 To control devices over cellular or while away from home, a 3rd generation Apple TV with firmware 7+ is required. 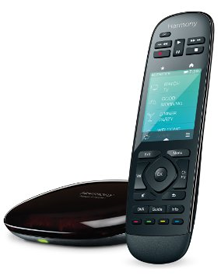 I found that I had to move my Apple TV from Ethernet to Wireless for this to work. I also had to sign out and in to iCloud a few times. 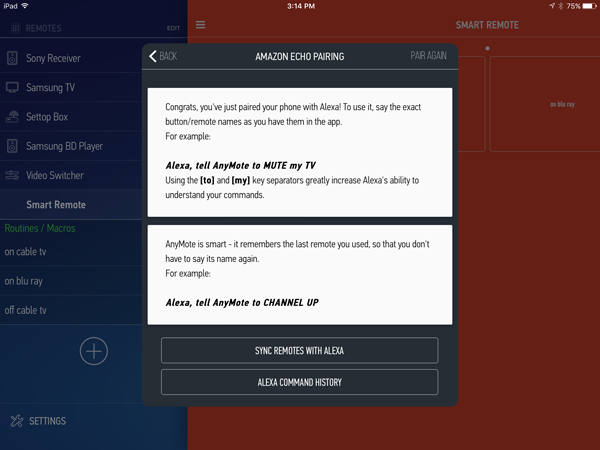 HomeKit works remotely using iCloud integration. Siri commands over cellular didn’t work, but using the actual Apps on my iPhone worked fine (with a short delay). All in all, this is great fun for an over the bleeding edge geek. I’ve got a great set up for Home Automation and Security, thanks to my Insteon devices and software, including the newly released Windows 8 Insteon for Hub App. 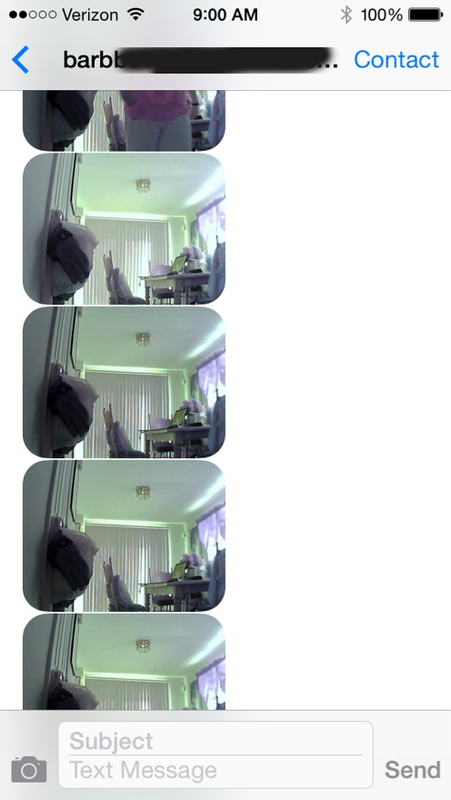 While I can set up my motion sensors to send email and text/SMS notifications from within both the iOS and Windows 8 apps, currently there is no way to configure alerts from the Insteon Indoor 75790 cameras. These cameras support both video and audio alerts, and I’d love to see an interface for configuring this, as well as other advanced features, inside the Insteon for Hub apps. I sat down this morning to figure out how to do this, and it was extremely easy. Start by logging into the web interface for your camera. You’ll need the IP and the Port you configured (don’t leave these cameras configured on Port 80). In other words, open your web browser and go to the address that looks like http://192.168.0.114:25114 that you set up when you configured your camera. Log in with your configured username and password. Next, navigate to the Mail Service Settings to configure the sender account and the receiver. 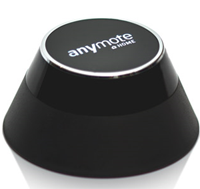 You can designate multiple receivers, so you can send text, SMS and MMS or whatever combination suits your needs. I tested sending with both a Comcast and a Gmail address. 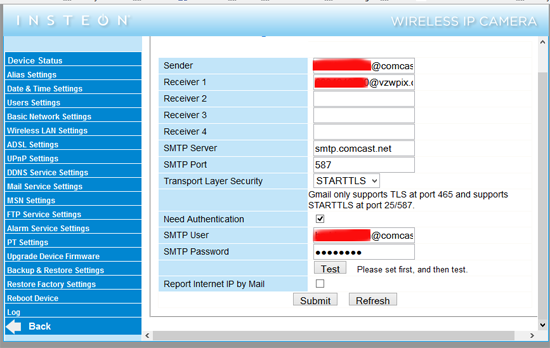 Comcast’s SMTP server is smtp.comcast.net and Google’s is smtp.gmail.com. 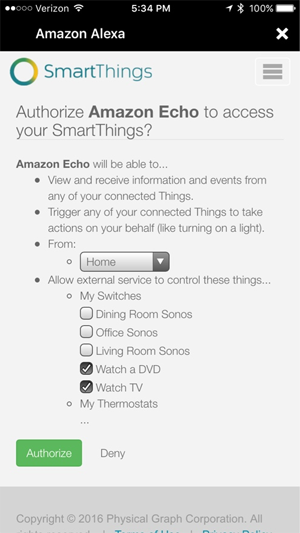 Both require the same settings, use port 587, STARTTLS, and need authentication. Configure your Receiver(s). For MMS, use your 10 digit phone number and your carriers email to SMS gateway address which you can normally find at your carrier’s web site. There is a large list at http://www.tech-faq.com/how-to-send-text-messages-free.html but I don’t know how current/accurate it is. For example, you can’t send images to Verizon phones via MMS using vtext.com. You can, however, do this with vzwpix.com. 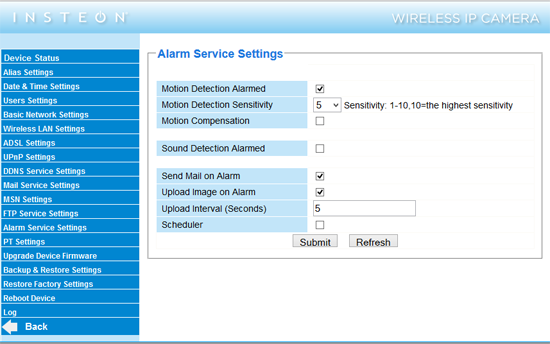 Check Motion Detection Alarmed and select Submit. Return to the Mail Service Settings and then select Test to insure your configuration is correct. I’d really like to see the ability to configure these alerts included in the various Insteon Apps, so that everything is part of a single, easily accessible interface.